Looking for makeup and foundation for oily skin? It isn't as difficult as it may seem. Here you'll find some advice on the type of makeup that can really handle that shine. Oily skin does have it's redeeming qualities. Things like suppleness and hence agelessness. On the flipside though, oily skin can be greasy looking, and also come with problems like acne and spots. So Why Is Your Skin So Slick, And What's Going To Clear It? Firstly, lets go through what makes skin oily. Sebacious glands(oil glands) that lie just underneath the skin produce oil. Just enough gives you good looking glowing skin. An oversupply looks and feels greasy to the touch. For acne to form, these oils mix with dead skin cells that clog up the pores. That is why sometimes, someone with oily skin might develop pimples after using pore clogging makeup. So to treat that kind of problem, the key is to break up the sebum and dead skin buildup, then clear it out of the pores. That's why it's very important to do the pre-makeup thing before applying that perfect foundation for oily skin,an also doing the weekly/ twice weekly masks. Here are some oil controlling and pore clearing ingredients that you should be looking out for in everything that touches your skin. Write these down, or bookmark this page on your phone so you can have this list when you next go foundation hunting! Beta Hydroxy acids are skin exfoliants. Salicylic acid is the most common form of beta hydroxy acids that clears the gunk out of pores. It's mostly found in higher concentration in spot treatments. If you have a severe acne problem, it's always best to consult your doctor about treatment. When applying anything with beta-hydroxies, you must remember to protect yourself with sunscreen as the products increase sun sensitivity. According to the fda the product is "safe as used when formulated to avoid irritation and when formulated to avoid increased sun sensitivity". Benzoyl peroxide helps skin by treating acne causing bacteria. Sometimes it's used in combination with other salicylic acid in oily skin treatments. Primer is a particularly useful step before applying foundation on oily skin. This is because your skin will naturally have larger pores to accommodate the high amount of oil being churned out. Yup, those oil glands can really clock up some overtime. So choose a primer that's water based(so water is one of the first ingredients on the list) and doesn't clog pores(non-comedogenic). This you should do with any liquid products that you'll be using. The big problem here is that most primers have smoothing ingredients like dimethicone. These are silicones that feel good and smooth out lines. They can be awesome for normal to dry skin, but can cause havoc on oily skin! A serum like Blemish Clearing Serum with oil control properties might work better than traditional primers under your moisturiser and makeup. Diy fix: Try milk of magnesia after moisturizer on oily areas. This seems to help some people whose oiliness isn't too heavy. How do you brighten tired eyes, cover dark under eye circles, and most importantly- hide spots? Use an oil free concealer, in your skin color, that you will dab and dot. For tired eyes use one like Elizabeth Arden's Ceramide Lift and Firm Concealer , that feeds and tightens the skin. For spots, use something that treats them at the same time like the e.l.f. Essential Zit Zapping Concealer . Concealer is especially great if you don't want to wear much foundation in those hot summer months. 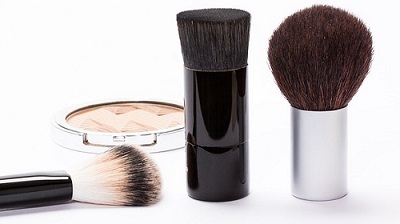 Never apply concealer straight from the container because bacteria might transfer and build up. This will ruin whatever's left inside the container... Plus it's easier to get just the right amount when you use a brush. Then finish off with a light brush of powder over the rest of the face. Don't brush over the concealer when you apply foundation. Rather dab over it so that you don't take it off the areas that you've worked so hard to cover up. Foundation is the most important, yet problematic cosmetic for you if you're battling with an oily skin problem. This is where the oil fighting ingredients that are listed above will give the best result. Liquid foundation should be water based and oil free. A good foundation will instill some discipline into those oil glands! In a liquid formulation, there's more room to add oil fighting ingrediens. As opposed to powder, where the ingredients are limited to those that will just absorb the oil that's produced. If you're treating the skin under the makeup, powder will just mop up the little extra oil, and is probably your best choice. If you're not treating the skin, then opt for a liquid foundation that has oil blasting capabilities. Powder, by virtue of being oil free, is always seen as the best solution for dry skin. Why does it sometimes not work like it's supposed to? It's because a lot of women make the huge mistake of piling it on, hoping that the oiliness will surely be taken care of. This route can actually make the problem worse by adding to the sebum-dead skin-mix that causes acne and blackheads. You might then have created a new acne problem on top of the oily skin inconvenience that you're trying to get rid of. So the trick with any powder is to ensure that the foundation is non pore clogging, and oil free. Yup! Not all powder is oil free. There are powders that have mineral oils and should be avoided if you have excessively oily skin. So always check your labels to ensure that you've got the right products. A genuine mineral foundation won't contain oil, so you might want to check them out as viable option over normal powder foundation for oily skin. When it comes to cheek dust, you'd think powder would be the best layer over any foundation for oily skin. The main goal with blush on oily skin though, should be staying power. Especially if you've done all the previous work with your skincare, primer, and then appropriate foundation for oily skin. A cream to powder blush will go on smooth and dry to a powdery consistency. It will usually last longer than just powder blush. Otherewise try a long lasting blush formulation like the Too Faced Full Bloom Powder Blush . The most important step is to get into a good skincare regime, and find the right kind of treatment.